I stayed up to watch Letterman last night even though I was DVRing it and even though I knew I’d have a rough go of things today. Even though tonight’s episode is officially the last one, last night’s show was the “last” guest, Bill Murray, who was also Dave’s first guest twice. In an age where most people watch most things time-delayed, I really wanted to watch this one as it happened rather than read about it and then see it. I’m not sorry I did it. As I’ve mentioned, I haven’t been watching Letterman much in recent years, mostly because of the time he’s on. When I lived in Wisconsin, he came on at 10:35, over at 11:35. Here in Eastern time, he doesn’t start til 11:35, so that midnight:35 is pretty late when I need to be at work at 7a. But watching last night didn’t feel like I had lost any time at all. There’s all the arguments and thinkpieces about how Dave’s lost his edge and is softer now after 30+ years in the biz and having had heart surgery, but none of that matters much to me. Dave’s brand of humor is something that’s always hit home for me, for the most part. People who say “so-and-so is better/funnier because they got better ratings than Dave” cause me to roll my eyes so hard they hurt for a week. Arguing from a “more popular = better” stance is one of the most ridiculous things I’ve ever heard, and, again, it doesn’t much matter to me what people think about the stuff I like. I like what I like. Watching last night was a weird mix of emotions. At its core, it was just another episode of The Late Show. Same kind of jokes, same sort of bits, all very familiar. I laughed outloud at some, shook my head at others, and before too long it was all done. Fastest hour of TV I’ve watched in a long time. Regis showed up, and it was great to see him (boy, he looks a lot older than I expected! ), and you can tell he honestly does love Dave. Dave doesn’t do emotion all that well (we Midwesterners have a hard time with such things), but you could almost tell there was an inkling that he might sort of maybe a little have a certain level of fondness for Regis, too. Dave had Rupert Jee on for a chat, and showed a video of some of their “Rupert does what Dave tells him to do over an earpiece” highlights, and I sat there and thought, “I’ve met him! I talked to Rupert!” and that made it more surreal and also more special to think back on all the times I saw him on the show. He really seems like a guy that’s just going to keep on working at his deli whether or not there’s a David Letterman in the same building as him. 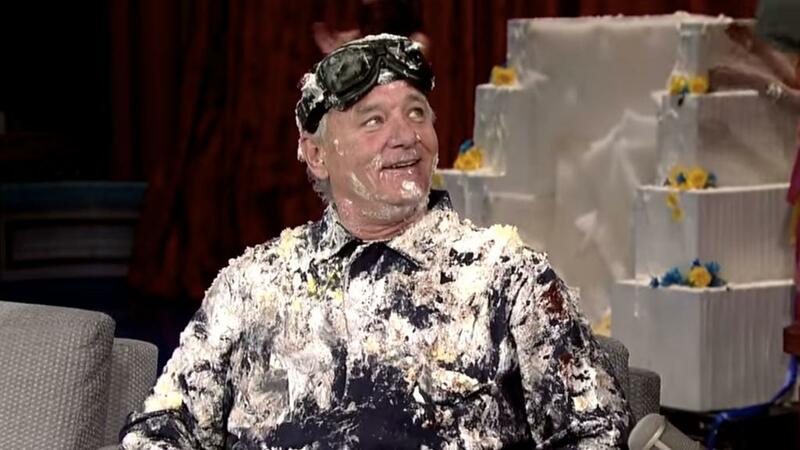 Then Bill Murray showed up, inside a giant cake. And then cake got all over Dave, and it was there for the rest of the show and that just made me think, “yep, that’s Dave.” His second-to-last show ever, and he’s got frosting all over him for a half hour or more of it. They showed a highlight reel of Bill’s previous visits, and the thing I love about Bill Murray’s visits and the stunts he pulled is that they’re just Bill. Sure, they’re over-the-top and ridiculous and sometimes make you think “what in the world was that?”, but they never seem desperate or “HEY LOOK AT ME” like some other famous comedians I could name but won’t. They were just Bill, and I’m glad he was the last official guest. Very fitting. Bob Dylan showed up to sing and I could understand all his words, and it was fine. I swear he and Adam Sandler look more and more alike as time goes on. Bob didn’t really seem like he wanted to be there, but it was nice that he was. I feel like I’ll be sad while watching tonight. It’s hard to explain exactly why. It’s just a show, Dave’s just a guy who cracked jokes and talked to famous people and sometimes had pets on to do silly things. But it was something to count on, I guess, something I could miss for weeks at a time but then pick right back up and not feel out of place. There was something comforting about a cranky guy being on TV every night, and something inspiring about it, too. I’ll miss him like the last generation probably misses Johnny Carson, but I feel like I’ll miss Dave more than they missed Johnny. Dave is such a huge part of the sense of comedy I’ve built over the years, and a presence that was always just kind of there. I suspect we won’t hear much from him after he’s done tonight, and he’s certainly earned that, but I’m certainly going to miss him. How many of you will be watching along with me tonight?